We had so much fun taking these close-up photos of the new yarn! Aren’t the colors so nice? The Lion Brand Suede is called Spice, and it is so soft. The Paton’s Bohemian is called Artistic Taupes and has so many pretty colors in it. I am almost finished with Mary’s hat in the Bohemian. It is so very soft! I will post a picture of it when I am done. I am also finished with the Piggie Bag Holder and, of course the Bunny Towel Holder and both are now photographed. I just have to put the bow and the windchimes on the Lamb, and she is completely done also! 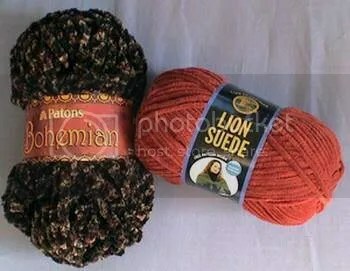 Here is the pictures of the Paton’s Bohemian and the Lion Brand Suede I bought yesterday. 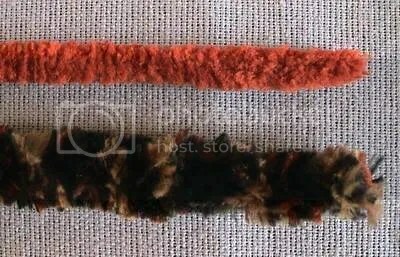 I also got a close-up picture of the individual strands I will post next. I love the colors! >Mary’s hat is almost finished! The Paton’s Bohemian works up so quickly and so nicely! It is so soft also. I used a K hook, and I crocheted the hat up very fast. This is a very nice yarn for chemo hats, especially for the wintertime. I will try to get some pictures posted tomorrow.